Details on this CV-22 Crash, caused by exaggerated performance data in the flight manual or a minor engine problem. A V-22 tiltrotor is unable to employ autorotation to land safely when engine power is lost or degraded because its rotors are much smaller than a helicopter's. Many pilots are shocked to learn that the charts in the V-22 Naval Air Training and Operating Procedures Standardization (NATOPS) are inaccurate. This is the pilot users manual relied upon for safe operation. The demonstrated performance of V-22 was so poor that Bell-Boeing executives decided to insert old optimistic "projected" performance data into NATOPS' range and payload charts. New V-22 pilots learn from others that NATOPS is hyped, but this still endangers flight crews who must learn the V-22's limitations through experience and guesswork. 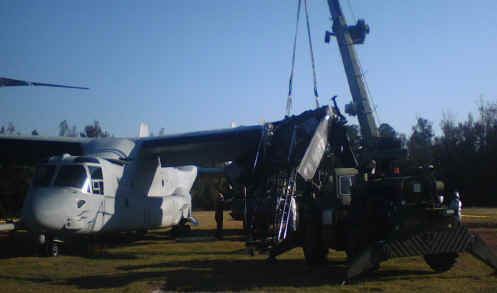 Cargo slid out the back of a V-22 as it took off, taking a Marine crewman with it. Although the Marine Corps mishap report clearly indicates the aircraft was airborne "200 feet" off the ground, Generals chose to label it as a ground mishap, so it is not counted against the V-22 safety record. I guess they can claim the Marine didn't die while in the aircraft, only when he hit the ground. One could claim that all crashes are "ground" mishaps, since they occur on the ground. However, the Navy Safety Center lists it a Class A FRM (Flight Related Mishap), just like a similar mishap involving a Marine CH-53E in 2005. Location SHORE Event occurred at a Marine Corps forward operating base in rural Afghanistan. The Marine Corps has failed to report a dozen Class A mishaps, even when a V-22 is scrapped afterwards. The photo at right is a V-22 after a 2007 inflight fire that destroyed the $2 million engine and burned up the nacelle, but the mishap was misreported as a Class B. Some details of unreported mishaps were published by a Navy observer in 2009 and a follow up appeared in "Wired" last year. Congress took an interest in 2009, and after much stonewalling, the Marine Corps admitted that 29 of its 105 new V-22s were not flyable. Half of those can be traced to retired test aircraft and crashes, but the Generals did not provide details on why more than a dozen of their new V-22s had become permanently "unflyable". "After it finished turning, it had tailwind. The pilot tilted the nacelles forward. The moment arose around the vertical with flying low speed because of the travel of the center of gravity forward due to the movement of nacelles and tailwind." Summary MV-22B crashed during day VFR departure from LZ in Morocco. 2 fatal, 2 injured. Pitch-Up With Side-Slip (PUWSS) is a problem unique to the V-22. As the rotors tilt upward to the hover mode or transition to the airplane mode, the V-22's strong downwash suddenly blasts its tail empanage, causing the nose to rise sharply and the aircraft to slip toward one side. Test pilots found this disturbing, so flight control software automatically dips the nose when this occurs. This works well in still-air, but high winds or maneuvering during the PUWSS computer auto-correction phase is dangerous. A third problem is the V-22's boxy fuselage, which provides more internal volume than older cylindrical shapes, although 25% less than the CH-46E. 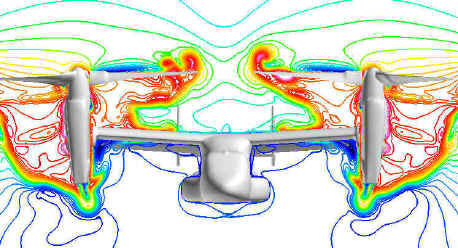 However, this allows high winds to push it sideways, a situation made worse by the large side profile of the engines and tail. This makes hover operations in high winds dangerous as the V-22 wants to "weathervane" and turn. A V-22 requires up to 80% more power to hover in high winds, and if extra power is not available because it is loaded with payload, control may be lost. A 2005 NASA study (pdf) provides details on this problem. The Marine Corps has avoided this problem by imposing flight limits in bad weather. However, this mishap occurred during a major exercise with many VIPs in attendance. It would be very embarrassing to keep the V-22s grounded because of winds while helicopters flew. One can blame the pilots, stating they must not transition from a hover to the airplane mode in strong winds. However, landing and taking off from an LZ requires much concentration, and its difficult for pilots to note wind speed and direction as they depart. The flight software became confused as well, causing an "over modulation" i.e. over correction. It's difficult to blame the pilots, except for attempting to fly in windy conditions. On the other hand, weather conditions may change rapidly, and may not be known hundreds of miles from their base. A CV-22 got to close to another, knocking some air from under one proporotor and causing an instant snap roll. As reported by the wing commander. “It was a two aircraft formation training. When the lead aircraft turned around they could not see their wingman behind them. They did a brief search and found the Osprey had crashed on the range,” said Col. Jim Slife, commander for the 1st Special Operations Wing. Officials said the Osprey was found upside down, on fire." This V-22 rolled over so fast the pilot couldn't even mutter a Mayday! This disproves the theory that overcoming "roll off" simply requires the pilot to rotate the nacelles forward to get new air under the proprotors. That requires several seconds, and the aircraft can roll upside down in two seconds before the pilots can react. And as always, the lightweight plastic skin caught fire and the V-22 burned up. VTOL/CONV: Minimum separation is 250 ft cockpit-to-cockpit and 25 ft of step up. During approach and landing phase, maintain step up until lead lands or maintain 250 ft separation. While maintaining 250 ft separation, avoid 5 to 7 o'clock position downwind of the upwind aircraft. a. Crossovers in descending, turning flight prohibited. b. Crossovers in descending, wings level flight prohibited with ROD in excess of 500 fpm. c. Crossovers shall maintain at least 50 ft of step-up. These V-22 limits were imposed because the wake or downwash from another aircraft can affect one tiltrotor before the other, causing an instant snap roll and crash. As a result, V-22s must remain a football field apart and fly at different altitudes. A "wave" of V-22s is never more than three aircraft, and only one can take-off or land at a time. Such restrictions do not apply to helicopters. One can blame the pilots, but they maneuver and cannot see everything 360 degrees around them as they perform other tasks. The fourth problem is that the downwash or the wake from nearby V-22s and helicopters can cause more lift to occur on one rotor than the other, causing a snap roll. Downwash from other aircraft can impinge on one wing, causing it to dip down and bang the engine on deck, even while parked, as described in this internal NAVAIR report (pdf). This is why one never sees V-22s flying in the hover mode in close formation. NATOPS requires a 250ft. separation between V-22s to avoid VRS, which can cause a V-22 to instantly snap roll. Standard Marine Corps helicopter assault tactics land six CH-46Es in a football field sized LZ, yet only two V-22s can safely land in that size LZ at the same time. Here is a video clip of V-22s attempting an assault landing. They must select a hard surface LZ, lest their heavy downwash clog their engine filters. They must land very slowly to avoid VRS. They can get three in the LZ if one lands first, as this video clip demonstrates. http://www.youtube.com/watch?v=n1oekSObO3I This also dispels the myth that V-22s can land in an LZ faster than helicopters. These four issues combined with the inherent instability of the tiltrotor and other issues like VRS, bad weather, unexpected wind gusts, and minor pilot error can overwhelm the flight control computer. This already happens in less complex environments, causing a temporary loss of control. This is no problem unless an aircraft is close the ground, like with the B-2 in Guam. However, a V-22 is likely to encounter such conditions attempting to land or take-off near the ground, and given its high sink rate and tendency to snap roll, its flight control computer may not have a couple of seconds to stabilize the aircraft before it rolls over. Happen to be a lieutenant colonel in charge of a squadron that has a crash he had no way of preventing or foreseeing - get fired and have your name and picture splashed all over the internet with no hope of any future promotion or position of authority. Happen to be a full-bird colonel (C-130 pilot, no less) who attempts to tactically fly and land an aircraft he was totally unqualified in, almost crashed, flies the damaged tilt-rotor back to base, hops off and allows the crew to continue flying for two more hours - get downgraded in your primary aircraft (the Herc) for a week, then get requalified and stay on as the Group Commander with a possible shot at Brig. General. Difficult to say why the 8th left OEF. The CV-22s are hard to fit into most SOF current operations because they really are unique airframes and require concrete or asphalt landing pads for any kind of sustained operations. You can't use them for MEDEVAC or CSAR, the downwash is too massive. The dirt and dust of Afghanistan (and pretty much any other dry/desert area) eat their engines up at a phenomenal rate. I heard one rumor that they were replacing those Rolls-Royce engines every 70 to 100 hours, sometimes even less. Those engines cost a mint, so you can imagine how that affects the cost of a downrange deployment (or even home station training). Add in the hydraulic problems (5000 psi system vs. the 1500 to 3000 psi used in all other rotorcraft and C-130s) and software issues and it's just too complicated of a bird for combat operations. Having said all that, I think the concept of the V-22 is legit. We do need something that breaks us out of this 140 KIAS limit we seem to be stuck in with helicopters. I'm all for pushing forward with new designs (Sikorsky has come up with some really cool new versions of the helicopter recently, for example). The problem is, the Marine Corps convinced themselves that they needed to rush it through test and development to replace the incredibly old CH-46s and the USAF went along with them. So now, you have an operational aircraft that is still having test phase kinds of teething issues and people are dying trying to make it work in the operational side. In my eyes, they need to transfer all the birds to the USMC, send them up to Pax River and finish testing and modifying them. The CV-22 is not ready for prime time, simple as that. Maybe in 5 or 10 years after more test and development, but right now, it's a widowmaker. "The bottom line is that all of the these concerns argue that V-22 is likely to have a larger accident rate when operating within a combat or hostile environment than any conventional helicopter simply because the aircraft has many more ways of getting into trouble than does a conventional helicopter. Unfortunately, all of these issues are the result of basic design features in the V-22 and cannot be changed – the side-by-side rotor configuration, the high disk-loading, and the roll/yaw control implementation through differential thrust. There is not much that can, physically, be done about it. Extensive education and training of aircrews and better warning systems will certainly help, but will not remove the fundamental susceptibility." What do the aviation experts from around the world think of the tiltrotor concept? No one has purchased any from Bell-Boeing, and no one is designing their own tiltrotor aircraft. The U.S. Army, Navy, and Coast Guard do not want them, nor do any airlines or foreign military services, despite the constant spin that some nation "is expressing interest!" The Special Operations command chose to buy more H-47s and wants no more CV-22s, and the U.S. Air Force has refused to consider them to replace their aging H-60 CSAR helicopters. Meanwhile, Bell helicopter abandoned its civilian tiltrotor program and just introduced a new medium lift helicopter, at one-sixth the price of a V-22. V-22 success stories have been spun in the press this past year. Two V-22s flew to pick up a downed Air Force pilot in Libya, something no helicopter could accomplish. They didn't report that two Marine CH-53s flew alongside the V-22s carrying troops in case combat was required. And why were big, old cargo helicopters sent along to carry troops, when the ship had six other V-22s aboard? That rescue was not nearly as difficult as the 1995 rescue of a downed Air Force pilot in Bosina, which was accomplished by two Marine CH-53s. When our elite SEAL force flew into Pakistan to kill Osama Bin Laden, they chose old H-60 helicopters rather than their new CV-22s. Perhaps the H-60s were chosen because they are smaller, but the larger backup aircraft that were also used for this mission were CH-47s. As our military began its drawdown in Afghanistan, the first aircraft sent home were the new CV-22s! And the Marine Corps delayed the retirement of their 30 remaining 45+ year old CH-53Ds and sent them to Afghanistan, rather than send more new V-22s. An amazing spin was how the Marine Corps increased its total buy from 360 V-22s to 384, claiming this will save $1.75 billion. Marine aircraft are purchased through the Navy. Three decades ago, the Navy expressed interest in 48 HV-22s for shipboard use, but found them unsuitable due to extreme downwash, and chose the MH-60S for this role over a decade ago. However, the V-22 program kept the Department of the Navy order of 408 V-22s on the books. As the final production run of the V-22 is planned, no one pretends the Navy will get 48 V-22s, so the Marines laid claim to the 48 extras, and announced that it would help "save" money by adding just 24 of the Navy's unwanted 48 V-22s to their order. The Marines rely on the Army for medivacs in Afghanistan, as they did in Iraq. 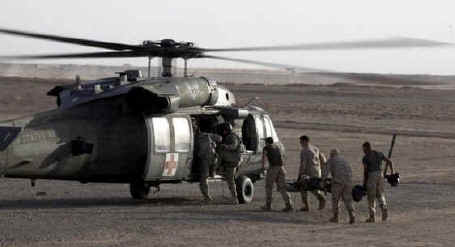 The V-22 program consumed so much of the Marine Corps' "blue" budget for decades that no thought was given to procuring medical evacuation helicopters, like the Army's proven UH-60Q, pictured at left evacuating a Marine wounded by an IED in Afghanistan in March 2010. Although the V-22 is 30% faster than the H-60, its large size, limited maneuverability, and intense downwash severely limits its LZ options. Moreover, the UH-60Q is customized for medivac, with better lighting, lockers full of medical supplies, a powerful heating system to prevent shock, with oxygen and chest suction systems. A version of the H-60 is in production for the Navy, so purchasing a "navalized" Marine version has been an option for years. As Marine Corps CWO2 Keith Marine stated about operations in Afghanistan: "Luckily the Army and Air Force guys will drop right where you want them to pick up casualties, we are lucky to have them."